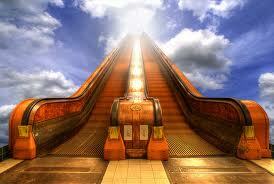 Usually when escalators show up in our dreams they are indicators of the direction we are going in our lives. Of course, down is backwards and we would want to figure out why. And conversely if you are going up you are going in the right direction. The fact that it is an escalator versus just stairs would indicate ease and efficiency. Today, however, we were shown three ways of riding the escalator; down, standing still and just riding it up and climbing the stairs as they are moving. Of course, climbing down on a moving escalator is definitely the wrong direction. But what of the other two choices? It would seem that just riding the escalator up would be a good indicator of “going with the flow”. Yet, I was being shown that climbing the steps as they were moving was correct. I had to keep asking why. Why is that what we are being asked to do climb the moving steps? The answer is because today the escalator does not represent life. It represents our “attitude” of life. We are being asked to embrace our life journey with anticipation and excitement. We are being asked to expect our highest good to be at the top of those stairs and to be giddy with that expectation. That is the HOPE. -Meditate…..try to tap into your inner light. -Get outdoors and take in at least 10 deep breaths. Remember to breathe deep whenever you feel tension or anxiety. -Write down some HOPEs. What would you like to see at the tops of those stairs? -Finished a good book and started another.